The PM20 Series of Fiber Optic Power Meters are robust, full-featured, handheld instruments, which together cover the full range of optical fiber applications within the 400 - 1700 nm range with optical powers ranging from -60 dBm to +23 dBm (1 nW - 200 mW). A rugged enclosure, internal sensors, and kickstand make these models ideal for field or lab applications. Efficient, low-power circuitry provides long battery operation ideal for field service personnel. 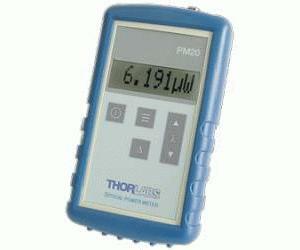 The alphanumeric 8-digit LCD display allows easy power read-outs. The operation of the device is intuitive and supported by a clearly labeled key pad. All common features like wavelength setting, relative measurements, power read-out in dBm or W, and auto-shutdown are included. The PM20 is powered by a built-in rechargeable NiMH battery or by the included AC adapter that also recharges the battery. The unit comes with an FC fiber adapter. Most industry standard fiber adapters, including SMA, SC, and ST, can be ordered separately and easily installed.